Had a good day at work, ate lunch at my desk again and worked a bit later than usual. Got home and took off with Robin looking for a daily photo opportunity. We ended up in old Roseville on the parking garage right next to the Tower Theater. 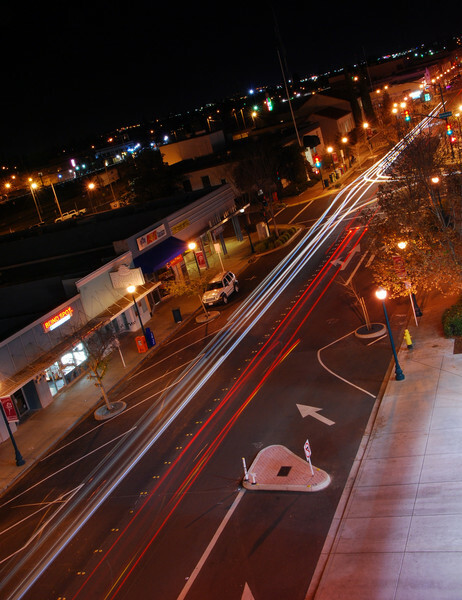 I grabbed this long exposure of Vernon Street before we ran off to dinner. We hit a nearby Chinese restaurant for dinner and then returned home to wrap up our evening together. Super cool shot. I'm really loving the flow of traffic, and the slight twist on the perspective. Great perspective and exposure on this shot! What a fabulous catch indeed! Very cool! Wonderful angle and trailing lights! yeah, I like the angle too as well as the trailing lights. Very cool!